If you haven't attended the Midwest Educational Technology Conference, make plans for next year in February. For library media specialists, there is a strand of workshops geared towards our needs. 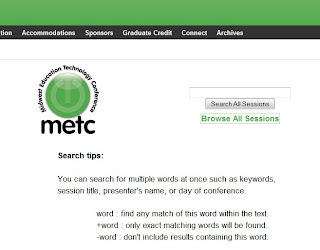 METC is a regional conference that pulls in speakers from everywhere. Since St. Charles Convention Center is just down the road from the St. Louis airport, the conference can have nationally known keynote speakers fly in quite easily. 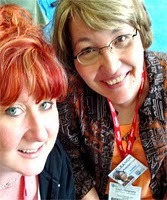 This year, my best network friend was a featured speaker for the conference - that Daring Librarian Gwyneth Jones. Gwyneth and I met over 3 years ago while exploring the virtual world of Second Life. At that time, Kathy Schrock and Doug Johnson had written journal articles about teachers and librarians learning this new approach to learning. Anyway, Gwyneth (Capt. Red - steampunk pirate librarian) and myself (Eleanor Anderton - Victorian librarian) had one of those moments when we confessed to being school librarians in real life!At the NECC - now called ISTE - conference in Washington, D.C., we met in real life for the first time with much squealing and talking very fast!! Since then, I have watched Gyneth expand her personal learning network like a meteor! How she finds the time, I have no clue! Back to the reason for this rambling blog! I had a great time this February attending the METC conference! Chatted with educators on my Twitter, like William Chamberlain from southewestern Missouri. Even after the conference, you can "attend" virtual presentations and work your way down a great list of links to presentation. Get comfy at home and work your way down the METC 2011: Virtual METC. To search for handouts and links to presenter's "stuff", click on Program - Searchable Program - then just Browse by Day and Strand. Check out the METC Smackdown Web 2.0. with Gyneth Jones, Gina Hartman, and Andrea Blanco which was a pre-conference workshop. Make sure you listen to Rushton Hurley, keynote speaker, who is a great educator, very nice person, and a fellow south Arkansas native. Learning never stops for we teacher librarians since there is always something new to read out there on the virtual web!